I have 2 posts to share for today! :) The first one will be a few more colors from Hard Candy's new line. These have been a huge hit lately and I have been pleased with them except for one. :/ I'm sure if you follow me on Facebook, you can guess which one that is going to be..
Crush On Caribbean is a bright blue with teal shimmer. I used 2 coats with no top coat. Glitter Jam has a pink tinted base with micro pink and blue glitter, smaller green and gold glitter and medium sized bright blue glitter. I used 3 coats with a top coat of Seche Vite. The green and gold glitters don't pop out on the nail, but the pink and blue ones sure do! 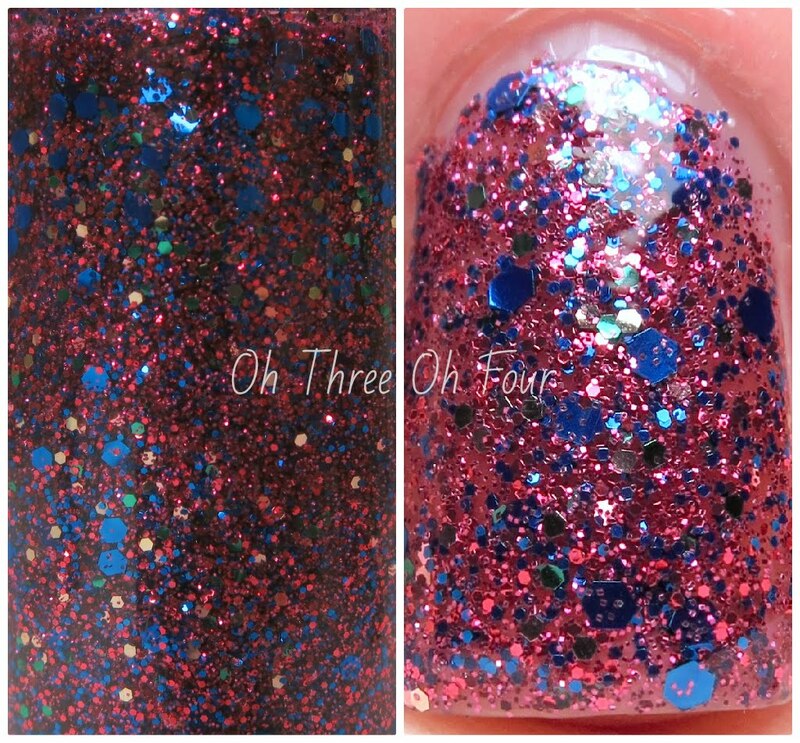 In 1 coat Glitter Jam would layer nicely over another color and it can also build up easily in 3 coats like shown. So far the other glitters from Hard Candy's new line have been pretty thick, in my experience, but the consistency of Glitter Jam was prefect! It dried quickly but will need a top coat, like most super glittery polish because it dries very gritty. Jubilee is a green jelly base with black micro glitter, larger black and gold hex glitter and orange bar glitter. This is 3 coats with 2 coats of of Seche Vite. If you saw on my Facebook page, I mentioned that this polish has very bad curling bar glitters. I returned that bottle I purchased for a friend, but just my luck received it from Hard Candy for review purposes. >_< Personally I'm not a fan of the color combination overall and the curling glitters don't help it. I did find by doing 3 coats and 2 coats of Seche Vite the bar glitters laid somewhat flatter than just one coat alone, though they still stuck up. The formula was ok; a little thick, but dried quickly. Little Hottie is a bright red-pink. All nails are 2 coats with no top coat. This color is really hard to capture >_< If nothing else it is very bright! It has a great glowing effect, like all the polishes in Hard Candy's Itsy Glitzy line. Formula was great again! Like Crush On Caribbean, it was almost opaque in one coat, but I opted for 2 for better coverage. Pink Taffy has a pink base with black, hot pink and silver glitters. All nails are 2 coats with a top coat of Seche Vite. Like Peach Pop, this color doesn't favor my skin tone. :( Looking past that though, the color is a nice bright pink and is a different take on Nails Inc. Topping Lane. So if you are looking for something similar to Topping Lane with a smaller price tag this would be great for you! Formula was a bit thin yet easy to work with, dried quickly and will need a top coat as it dries rather bumpy without one. Find the entire new 2013 Hard Candy polishes and makeup at Walmart in stores. I don't see the new polishes online on Walmart.com, but I do see the new makeup items on there! :) Also, I noticed some of the older polishes are online through Walmart.com still, if you were interested in any of those. Find Hard Candy on Facebook, Twitter, Pinterest and Instagram. The Hard Candy products in this post were sent for review, all opinions are my own.